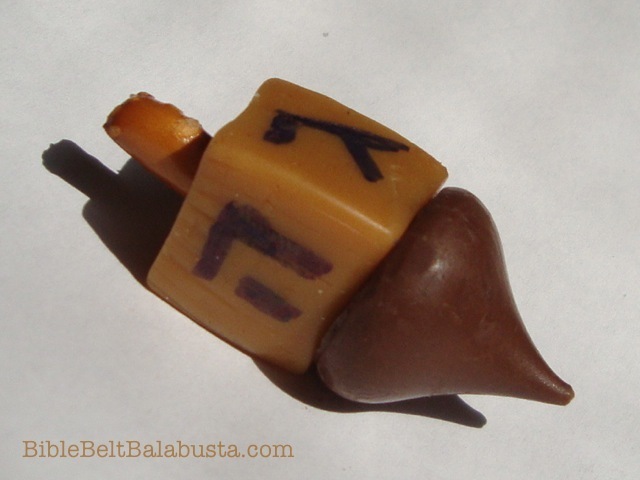 Before Sukkot, we had a single etrog. “The goodly fruit” of the Torah (Lev. 23.40). I introduced it alongside a lemon, so kids could see and touch and smell the external differences. One fruit was shipped from Israel, one fruit was from the grocery store down the street. We took turns shaking the etrog with the lulav and minding the pitom. And it was good. After Sukkot, we had 15 etrogim. And it was even better. First, we cut an etrog in half around the equator and admired the pattern (“like a flower,” “like a grapefruit”). Then, we ate it: peel, pith and fruit. 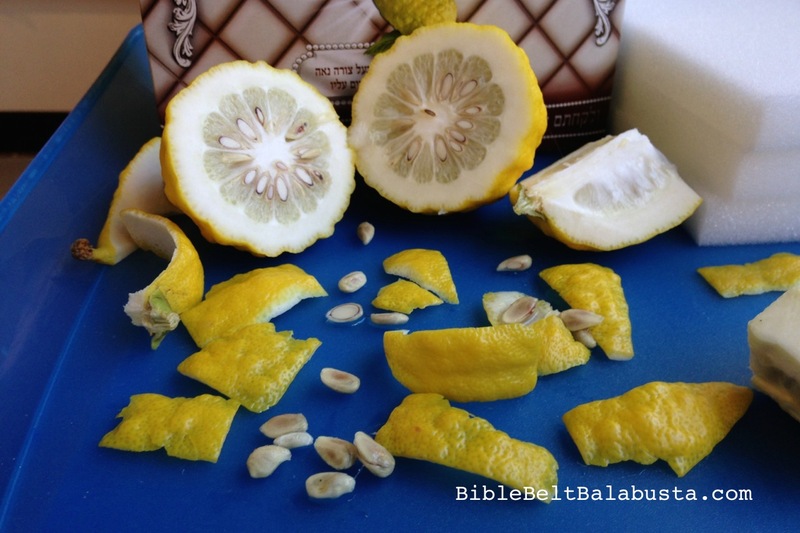 We had a taste test with a lemon, and the etrog won. Folks say the pith is bitter, but we all loved it. Then, we planted the rinsed seeds in little pots for the windowsill. Wish us luck. Update, a year later: The seedlings made it through the winter on a sunny windowsill. When temps head towards 40 degrees, etrog trees need to stay inside. (The botanical name is Citrus medica, by the way, and recipes that call for “citron” mean an etrog. Same thing.) Once Spring warmed up, I left the pots outside so that beneficial insects could keep plant eaters at bay. 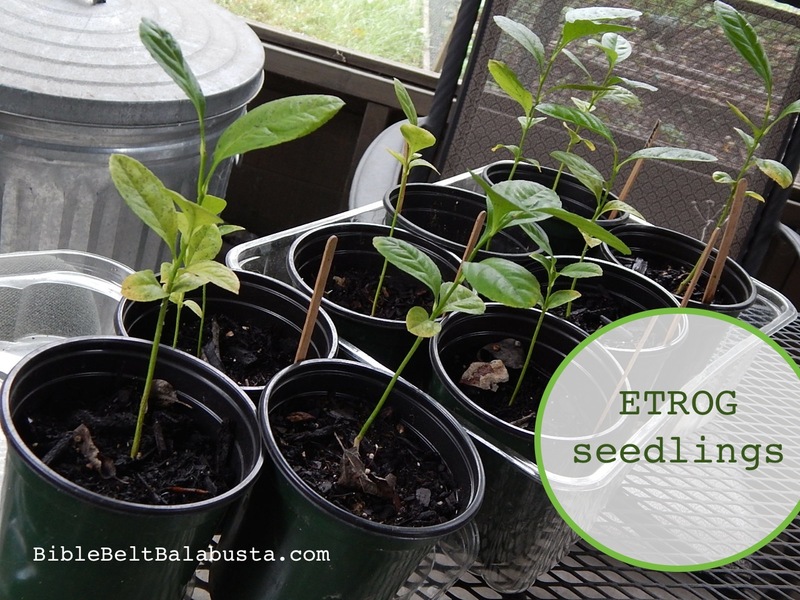 At 12 months old, each seedling is about 8 or 9 inches tall. 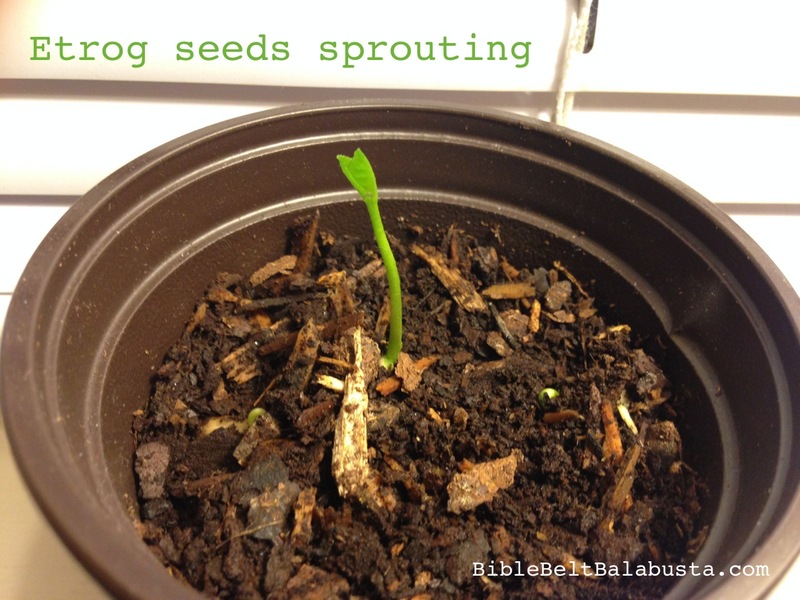 Who knows if these trees will ever be fertile, but we’ll try. They take about 4-6 years to bear fruit, and these will need to be repotted periodically and kept inside during our Nashville winters. Then, we made clove-studded pomanders for Havdalah besamim. We sliced the etrogim into chunks and soaked them for marmalade to eat for Tu B’Shevat. The seeds—full of pectin—are soaking separately, and the water will be added to the marmalade to help thicken the jam. Update: The marmalade turned out great. We cooked it in a saucepan inside an electric skillet in the classroom (like a double boiler). I used the easy recipe found at Not Derby Pie. The etrog boxes are too pretty and sturdy to recycle, so we’re saving them for a future project. 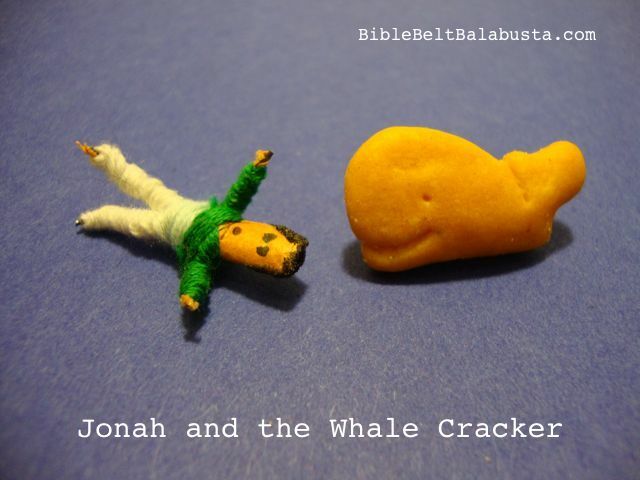 Mishloach manot containers? Besamim containers? 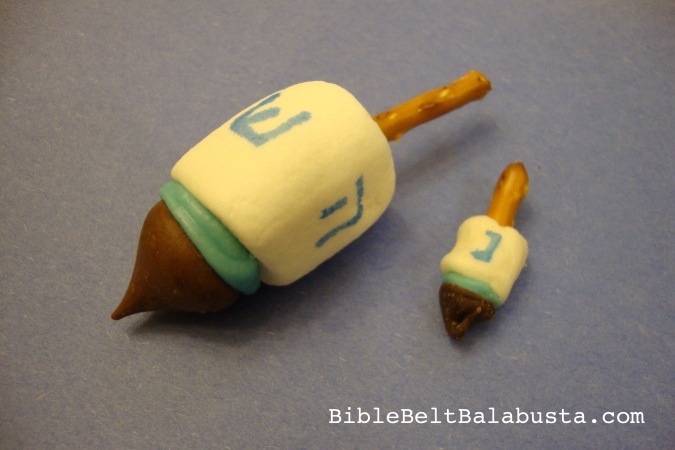 Mini Havdalah kits? Tzedakah boxes? Tabletop sukkah for a minifig? You tell me. 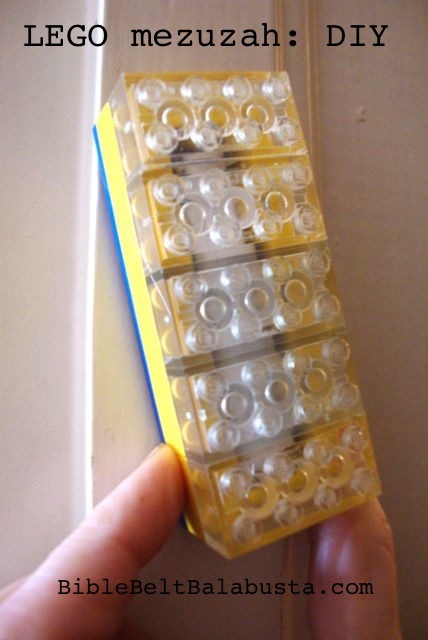 The padding inside the boxes is useful, too. Long ago, it was 100% palm fibers: fabulous. I’ve got bags of the stuff squirreled away for gosh-knows-what. 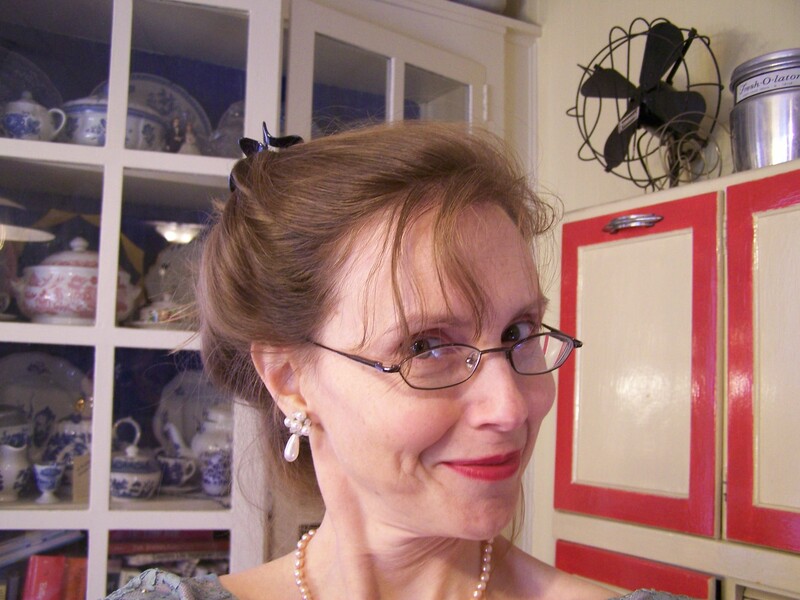 (I’ve made costume hair out them several times.) Nowadays, the etrog padding is soft foam rubber. We use this in the art room for various projects. At home, I’ve cut the foam into circles to make fake hamantaschen earrings for Purim. Even if you just have one etrog leftover after Sukkot, the dissection and taste test will be an unforgettable exploration. And, just one etrog can actually function as taste test and planting activity and marmalade. Who says you have to make a huge batch of marmalade? Or, skip the marmalade and just dry strips of peel for besamim. You don’t need a cache of 15 like we had. Happy etrog repurposing! I recycle lulavim, too: garland for the sukkah, baskets for the etrog, mats, bracelets, quilled sukkah ornaments, tiny brushes for Pesach chametz. See those links amongst these Sukkot posts. 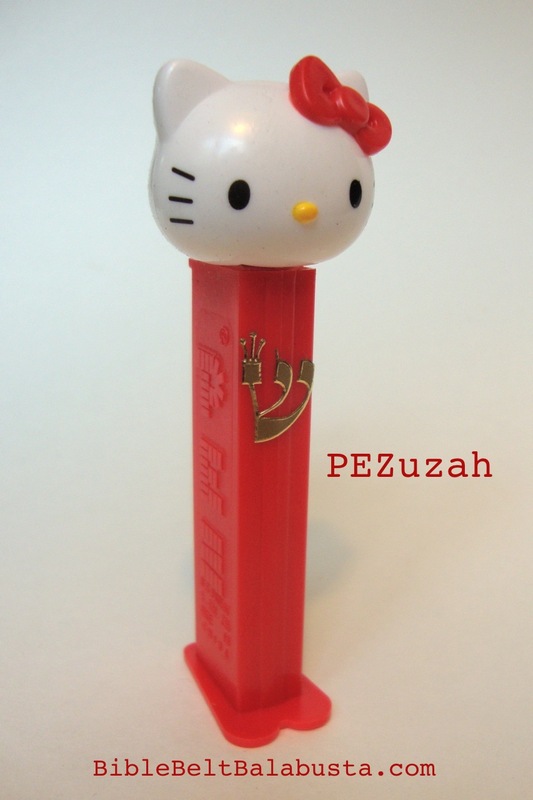 This entry was posted in Activity, Crafts, Nature, Sukkot and tagged besamim, etrog, Havdalah, recycle, repurpose. Bookmark the permalink. These activities all sound fabulous. 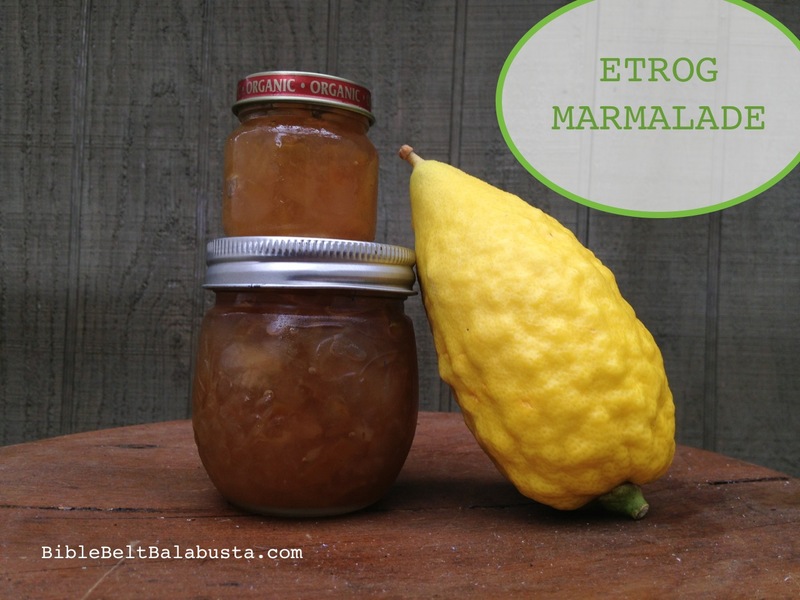 I would love to try etrog marmalade. I scored our congregations only etrog last year and made your clove pomander. Unfortunately the cost of an etrog here makes the concept of 15 of them eyewatering even to contemplate. Definitely a post that’s worth reading! 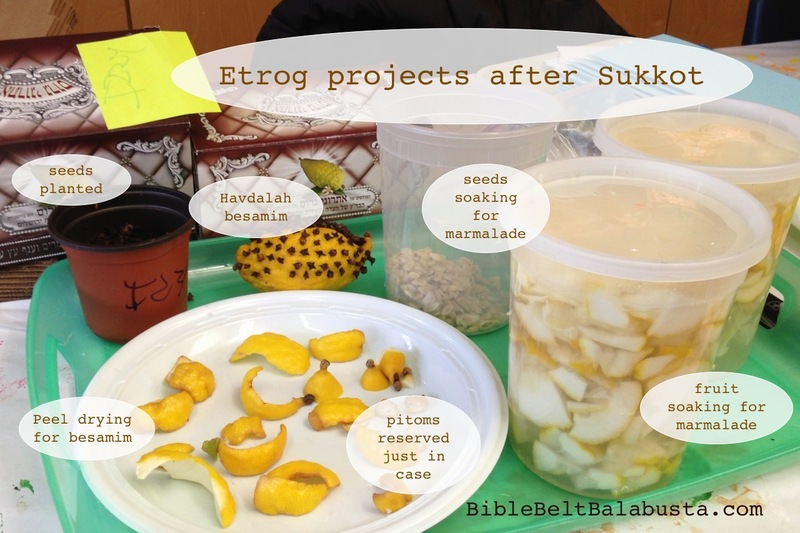 I’ve learned some new things such as what’s Etrog and how to recycle it after the Sukkot. Now I know!